On episode 16 of the Dynasty Crossroads Peter Howard (@pahowdy) and Jake Anderson (@JakeAndersonFF) discuss QB, Josh Rosen of the Arizona Cardinals from a film and analytical perspective. Were his college stats actually good? Can his fundamentals and talent overcome his situation with the coaching staff in Arizona? Listen here to find out what we think about Josh Rosen. On Episode 15 of the Dynasty Crossroads Peter Howard (@pahowdy) and Jake Anderson (@JakeAndersonFF) discuss Matt Breida from a film and analytical perspective. Not too often do Peter and Jake disagree on players but this is one of them. Is Breida the next big thing or was last week’s monster game a fluke? Make sure to tune in to find out! On Episode 14 of the Dynasty Crossraods Peter Howard (@pahowdy) and Jake Anderson (@JakeAndersonFF) discuss Phillip Lindsay from a film and analytical perspective. Listen to us try to project his role in the Broncos backfield and whether he’s a buy, sell or hold. 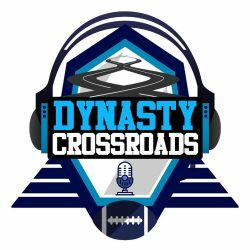 Dynasty Crossroads Episode 13 – James Conner: Smoke & Mirrors or Real Deal? On Episode 13 of the Dynasty Crossroads, Peter Howard (@pahowdy) and Jake Anderson (@JakeAndersonFF) discuss James Conner from a film and analytical perspective. We discuss his rookie profile and what we could expect if Bell continues his holdout. We talk about a couple of trades that Jake made since the news broke. Please subscribe, rate and review to help support the pod. Use promo code “crossroads” to save $10 on your subscription at www.thequantedge.com. On Episode 12 of the Dynasty Crossroads Peter Howard (@pahowdy) and Jake Anderson (@JakeAndersonFF) welcome esteemed guest Matt Waldman (@MattWaldman) to discuss Joe Mixon from a film and analytical perspective.